I don't know about you, but with the colder months coming around, my hands get soooo dry and irritated! Its definately a time to take special notice and care, and incorporate new treatments to your manicures. Plus, with the colder weather's long sleeves and sweaters, your hands are almost... on display! For clients looking for refined and deeply moisturized skin with a beautiful glow, the CND Almond Illuminating Masque is a great item to add to manicures to elevate the experience and leave your clients with glowing, conditioned hands. The sweet almond oil in this masque will soothe dry and irritated skin, while jojoba seed oil will moisturize and condition. 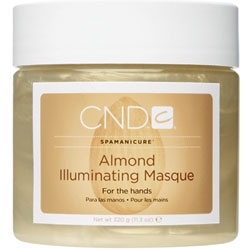 The CND Almond Illuminating Masque is definately something I would love as part of my manicure! Sweet Almond Oil: Softens and conditions, helps balance water loss and absorption. Soothes dry, irritated skin. Jojoba seed Oil: Deeply penetrating natural oil for excellent moisturizing and conditioning. Jojoba oil acts like a carrier to increase penetration of other ingredients. Vitamin E: Antioxidant known to neutralize free radicals associated with premature aging of the skin; softens and moisturizes. Mineral Oil: Non-irritating, effective moisturizer that promotes hydration during treatment. Apply a thin layer of the masque to the top of both hands and fingers. Wrap with warm towels or heated manicure mitts. After 3-5 minutes, remove towels/mitts and remove masque with clean water and a moist, soft sponge. Apply to hands with a disinfected facial applicator brush for a more refined service. As an alternative, use a professional lotion heater to gently warm masque and then drizzle on hands.